(eufrika) – With September being announced as first official Mbira Month, Zimbabwean musicians and artists throw a new light on the cultural importance of the mbira particularly for the Zimbabwean society. The organizers of the Mbira Exhibition Online and the introducer of the first international Mbira Month fear that future generation are at high risk of losing the musical inspiration of the mbira. For that purpose they call on every artist, politician whether on a local or national level as well as any governmental representative to introduce mbira music as an integral part in every school curriculum. With that the organizers put all their effort into the maintenance of the mbira in the Zimbabwean society. 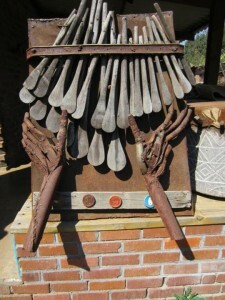 The next time you meet a mbira player, please let them know that in Zimbabwe, September is Mbira Month :-)! Thanks. The next time you run into our Minister of Education, his Deputy or any of his senior officials during Mbira Month, ask them what the Ministry is doing to put in place formal mbira education in our school system. Also ask them what the mbira community can do to help. Thanks. The next time you visit a National Museums, National Archives or National Gallery in Zimbabwe, please ask them to show you their mbira collection! Thanks.